German media reported on Saturday that 40 members of the Turkish military who served at NATO posts until a failed coup on July 15 have been seeking asylum in Germany due to fear of persecution and torture in Turkey if they return. 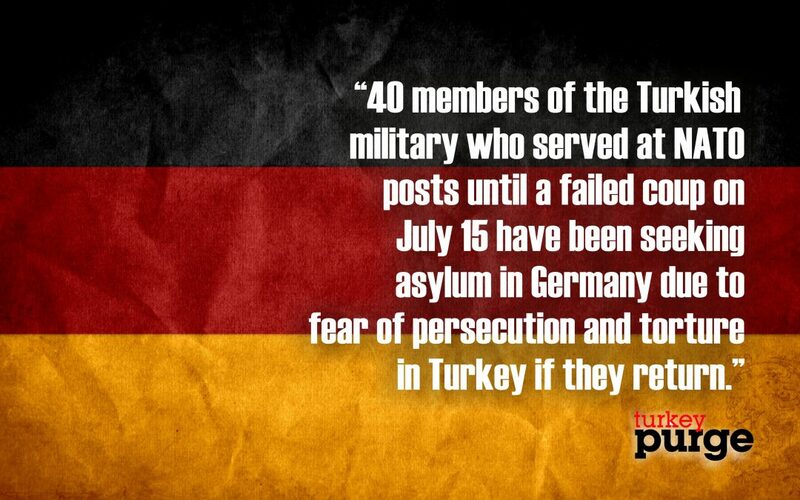 News magazine Der Spiegel and public broadcaster ARD TV reported on the cases of the Turkish soldiers, the majority of whom are officers, seeking asylum in German. Two of them claimed that a post-coup purge aims to cleanse the Turkish military of Western and secular officers, although they denied involvement in and even approval of the coup. The soldiers accused President Recep Tayyip Erdoğan of purging soldiers who are committed to the NATO alliance. The officers seeking asylum in Germany is expected to be an issue during German Prime Minister Angela Merkel’s visit to Turkey next week since Erdoğan accuses Germany of harboring terrorists. According to a previous report, Germany received asylum applications from a total of 5,166 Turkish citizens during the January-November period of 2016. The data of German Federal Ministry of the Interior show that there has been a rapid rise in the number of Turks seeking asylum in Germany since the failed coup attempt on July 15. While the number of Turkish citizens who sought asylum in Germany in January 2016 was 109, this figure rose to 702 for the month of November alone. Yet, the German government has declined to establish a link between the rise in asylum applications from Turkish citizens and the coup attempt. In the post-coup purge, including thousands within the military, over 135,000 people have been purged, according to a statement by the labor minister on Jan. 10 . Over 89,000 people are being held without charge with an additional 43,000 are in pre-trial detention.